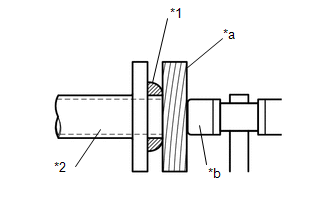 (a) Install the upper monolithic converter protector and lower monolithic converter protector with the 2 bolts and 2 nuts. 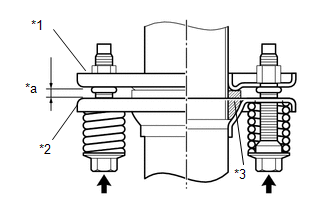 (b) Install the clamp with the bolt as shown in the illustration. (a) Install a new gasket to the front exhaust pipe assembly. (b) Install the front exhaust pipe assembly to the exhaust manifold sub-assembly RH with the 2 new nuts. (a) Install a new gasket to the front No. 2 exhaust pipe assembly. (b) Connect the front No. 2 exhaust pipe assembly to the exhaust pipe support. (c) Install the front No. 2 exhaust pipe assembly to the exhaust manifold LH with the 2 new nuts. (a) Install the exhaust pipe stopper bracket with the 2 bolts. (a) Install the center No. 2 floor heat insulator sub-assembly with the 3 nuts. (a) Temporarily install a new exhaust pipe gasket to the front exhaust pipe assembly. (b) Using a plastic hammer and wooden block, tap in the gasket until its surface is flush with the front exhaust pipe assembly. Be sure to install the gasket in the correct direction. Do not reuse the gasket. Do not damage the gasket. Do not push in the gasket by using the exhaust pipes when connecting them. (c) Connect the center exhaust pipe assembly to the exhaust pipe support. (d) Install a new gasket to the front No. 2 exhaust pipe assembly. (e) Install the center exhaust pipe assembly to the front No. 2 exhaust pipe assembly with the 2 bolts. (f) Check the free length. 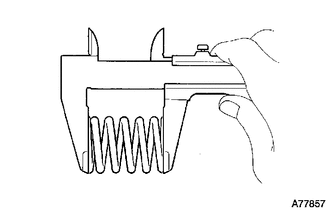 (1) Using a vernier caliper, measure the free length of the compression spring. If the free length is less than the minimum, replace the compression spring. 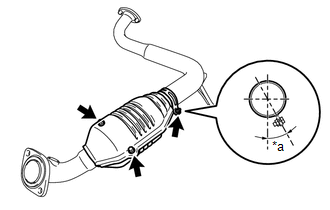 (g) Install the center exhaust pipe to the front exhaust pipe assembly with the 2 compression springs and 2 bolts. After the installation, check that the gaps between the flanges of the front exhaust pipe assembly and center exhaust pipe assembly are consistent front-to-rear and left-to-right. (a) Connect the tail exhaust pipe assembly to the 4 exhaust pipe supports. (b) Install a new gasket to the center exhaust pipe assembly. (c) Install the tail exhaust pipe assembly to the center exhaust pipe assembly with the 2 bolts. (a) Perform Inspection After Repair after repairing an exhaust gas leak.